To not only exist, but thrive as a poet is not easily done. All aspiring writers come to that crossroad sooner or later: to follow your passion, or succumb to a life of practical sustainability. Just ask Shane Book, an award-winning poet and filmmaker. 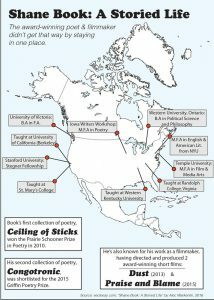 Prior to the publication of his first collection of poetry, 2010’s Ceiling of Sticks, which ultimately won the Prairie Schooner Book Prize in Poetry, Book struggled with even telling people that he was a poet, opting to describe himself as a filmmaker first — something he took up much later in life. “I think I was embarrassed about it… I didn’t have a book out, so… I didn’t feel like I could say that I was a poet,” Book recalls. This was despite Book having attended or taught at over ten universities across North America from Stanford University in California to Western University in Ontario. His latest collection of poems, 2015’s Congotronic, was shortlisted for the prestigious Griffin Poetry Prize, ultimately losing to fellow Canadian poet Jane Munro’s collection Blue Sonoma. Prior to the nomination, Book had applied three times for a position as the Writer-in-Residence at the University of Calgary— which he considers one of the most prestigious writing positions in Canada — only to miss out by a small margin. “They would send me a note [saying] ‘you were the finalist, you were our alternate person’… or ‘please apply again’ so, I did. I just kept applying and I wanted to see Calgary,” Book explains. 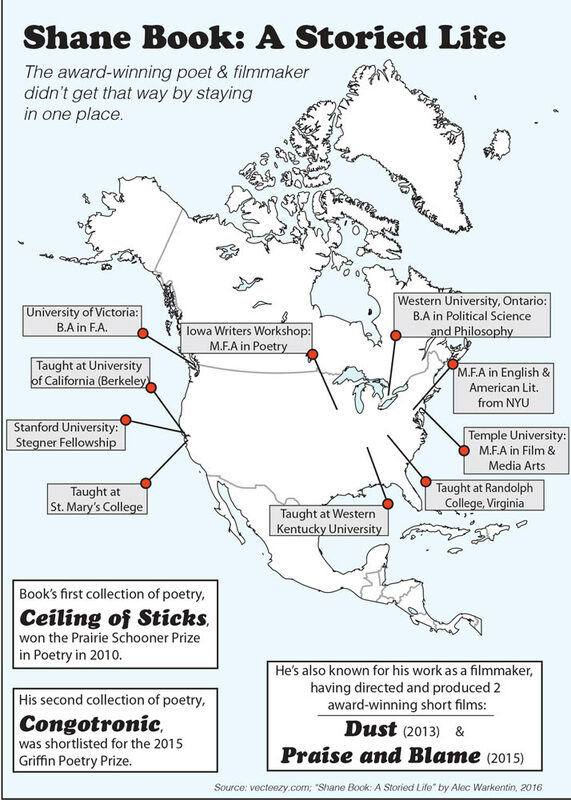 With a history that involves holding a long list of other significant positions across the U.S. and Canada, it wasn’t for a lack of experience that Book was turned down so frequently, and he’s supplemented his career as an established poet by also finding success as a filmmaker as well. So far, Book has directed and produced two short films: Dust, in 2013, and Praise and Blame, in 2015 — the latter featuring Costas Mandylor, best known for his work as Detective Lieutenant Mark Hoffman in the SAW horror film series. While Book’s own stance on the matter of young writers isn’t quite as grim, he does believe that to pursue a career in writing requires an insane compulsion to do it, regardless of if you’re going to get paid or be successful. “I tell my students that it has to be something that you just can’t not do,” Book says, who explains that the need to write just isn’t a lifetime occupation, but more of a vocation — a calling — and that aspiring writers have to be willing to be humiliated, and humbled, frequently. Book believes that the downplayed importance of poetry and creative writing has to do with the “screen culture, the advent of television, and the advent of the internet” which has led to people reading a different kind of way. “It’s shorter, it’s a kind of linked reading,” Book says. “We don’t have time to sit with a book… like a book of poems takes a lot concentration and it’s intense… you can reread them multiple times and they’ll sort of grow like flowers,” something that isn’t present when it comes to reading online, he explains. Ultimately, Book’s career as a writer, poet and filmmaker hasn’t been an easy one. The success that he’s found is rare — in part due to the tumultuous attitude towards writing as a profession and also in regards to Book’s lack of interest in marketing himself — something he says is important in order to get your name out there. “People go really far on being great self-promoters, just like in any business,” Book says. Book recalls a conversation he had with a friend who believed that the reason Book wrote was because he wanted the fame that came with it, and that he wrote for selfish reasons.